Do you have a vision of a piece of jewelry but can’t find it anywhere? Do you have a piece of old, family jewelry that you’d like redesigned? Allen’s Jewelers will take your existing jewelry and remake it into your vision with the style and quality you expect. It will be a treasure you and your family will enjoy for years to come. 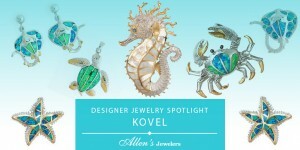 Learn more about custom jewelry design at Allen’s Jewelers. To meet our Master Jeweler in person or for the full experience, contact us to schedule a tour of our studio gallery! 1. In the beginning of the custom design process, our Master Jeweler will review design styles to determine what you like. Also discussed will be the types of material options such as gold, platinum, and accent stones that are available as well as the pros and cons of each. 2. The next part of the process starts with our Master Jeweler creating preliminary sketches. 3. Once ready, you will review the sketches together with our Master Jeweler for revisions or alterations. 4. When you both reach a design that you are happy with, our Master Jeweler will create a raw mold for you to inspect and review. This raw mold gives you a better idea of how your final product will appear. 5. 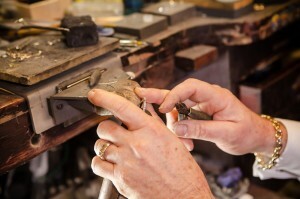 Once the raw mold is approved, we will get to work crafting your jewelry piece. Custom design takes time, so give yourself plenty of time, about 4 weeks for custom design. Of course, if you’re on a deadline, we may be able to get a design done faster than that. Please call us to inquire about time frames of short notice. The first and perhaps the most important point to consider when choosing custom design is the reputation of the jeweler you choose. 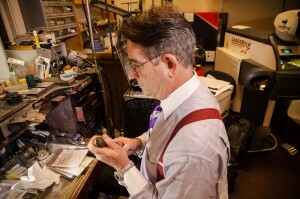 To ensure your piece is everything you want it to be, you must work with an experienced jeweler with a stellar local reputation, like Allen’s Jewelers. Our Master Jeweler has the experience and professionalism to design and create a piece of beautiful jewelry that you will appreciate and treasure. We enjoy creating one-of-a-kind jewelry for our clients, every day. Our entire professional will staff will work with you to create your unique, custom design based on the style, gemstones, metal, and related details, to develop an artistic expression to fit your needs; a treasure you will be able to enjoy for years to come. If you’re considering custom design, visit our custom jewelry section in our website for some of our most popular custom pieces then call (904) 221-9998 to make an appointment for your custom jewelry project.